Please select an option 7 8 10 Please select a ringsize. 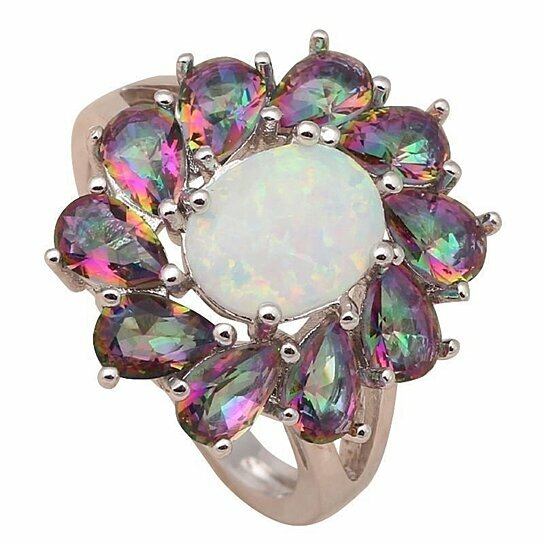 Opal is a stone of protection, faithfulness and loyalty. It is said that it can enhance super sensible vision and creativity. Not unlike the malachite stones, opals are mystical gemstones of high vibrations. As such, they can have a wide spectrum of application on the physical as well as on the higher levels of existence. Some say that opal is able to absorb thoughts and feelings, to enhance them, and sent them back to the source. Topaz helps in establishing a practical point of view when it comes to life in general. It is thought to be able to point in the direction of the most practical solution to any problem or situation. It helps us to walk the distance between point A and point B in our everyday life without loosing time. Topaz can help us in our daily meditation and visualization. It can open us towards the universal energy and give us new courage, will and strength to make the necessary changes in our lives. Item is sent from outside the U.S., Please allow 5 - 20 business days for the item to arrive.